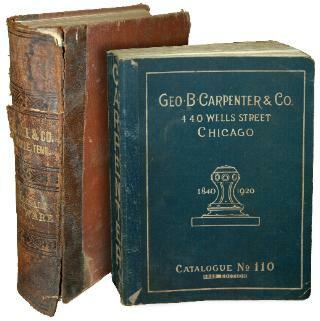 OLD Catalogs are the backbone of modern research into tools and the history of technology. Sadly the history of technological change is poorly recorded and often inaccurately reported. Once a manufacturer is gone there is only one record of what they produced and when. Patents are also a source of such information. However, many tools are not worthy of a patent and many patents are for devices that were never produced due to being impractical to manufacture or other reasons. So we are back to catalogs. Catalogs only tell a small part of the story. Most industrial catalogs do not provide information on the actual manufacturers of many items. 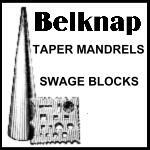 In the case of swage blocks many are sold with no information other than dimensions and price. So, we look for the oldest possible catalogs and a variety of catalogs. The two above are from the late Hunter Pilkinton's ( -2007) World of Tools Museum. They are from a reference library he has collected over 60 years. I have been collecting catalogs for research (when I could afford it) for a much shorter period of time but I have some that were new when my father got them in the 1950's as well as a few that I was just lucky to find. There is also a small number of catalogs being reprinted or committed to digital images. See the bibliography at the bottom of this page for some details. Illinois Iron and Bolt Co. catalog page. Thos. K. Carey &l Bro's Co. Baltimore, Maryland 1899. Engine, Boilers, Pumps, Metal & Wod Working, Machinery. 808 pages. (first Edition 1886) - authors collection. Carey Machinery & Supply Co. Catalog 10th Edition. Baltimore, Maryland 1929. 624 pages. - authors collection. 1912 Dutch tool catalog reprint by Hottemper Publishing. 220 pages - authors collection. Sears, Roebuck and Co. Chicago, Illinois. 1915. 1985 second printing by the Mid West Tool Collectors Association and the Artist-Blacksmith's Association of North America. No blocks or cones - authors collection. 1926 Newark, New Jersey. Known for their jewlers and precision tools they carried every variety of craftsman's tools. Dappping blocks - authors collection.